Ultraviolet (UV) sterilization is used as a pretreatment and/or post treatment step, along with Silver and Copper, to kill or inhibit growth of microorganisms, remove ozone, chlorine and trace organics and reduce total organic carbon (TOC). In UV sterilization, the water is exposed at a controlled rate to ultraviolet light waves. The bacteria absorb the UV radiation energy, which destroys or inactivates their DNA, thus preventing the bacteria from reproducing. 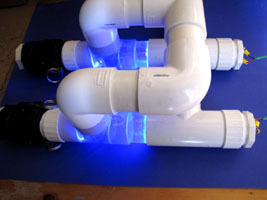 UV systems in ideal circumstances may reduce 99% of bacteria in the water. Our solid-state UV lamps are powered by low voltage 24 volts and are immersed in flow of the water in the same chamber as our electrodes. No fragile, expensive high voltage lamps or quartz windows are necessary. Silver and copper ionization works well with UV and has been demonstrated to inactivate many pathological organisms, viruses, moulds, yeasts and to boost immunity and is available legally for sale in many drugstores. Biophysica’s superior form of Silver-charged water has an exceptional range of effectiveness such that it has been used in situations of morbidity either alone or in combination with other remedies.